We can do varieties with toor daal.One such is pappupulusu with tomatoes.On auspicious days when no onion- no garlic variety is required then one can opt for this variety. Roast the toor dal to light brown colour. Then wash it and pressure cook it until 3 whistles and keep it aside. Take a pan on the stove,add oil to it. After the oil is heated,add mustard seeds ,jeera, redchilli slits and allow to pop,next add green chilli slits,curry leaves hing,and haldhi.Fry it. Now add tamarind juice, chopped tomatoes, cooked daal, prepared powder and salt to taste. Now mix well.Let it cook and boil . After it is fully boiled add chopped corriander leaves and switch off.Serve hot. we can do pesara pappu pulusu also in the same manner,with moong daal. this is new to me..i like it...nice consistency.. Comfort dish and love to have this with garam rotis. Nice dish, like to have with chapathis or rice. Love all your recipes, Please keep posting...whenever I try your recipe, it comes out all tasty and my family keeps asking for more :-). 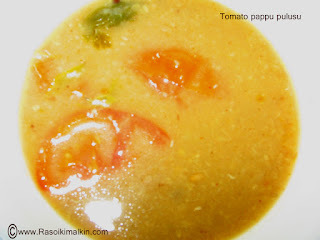 Nice variation of making pappu pulusu. Hi Kanthi!!! Dal looks tempting!!! Thanks for sending it to CMT!!! Kindly include link to the Event announcement page also (Mine & Jagruti's)!! This way we can spread the word about the event!!! !